Errwood Hall was especially a happy place where children played, for as well as being their home, it was also their private playground. When the snows came, it was a season of great delight not only for the children, but for the young ladies and staff at the Hall, when sledging would take place on the hill behind Castedge. Everyone would join in, often just leaving the housekeeper alone with the owners until the early hours, singing and shouting happily all night long, such a great event it was. Summer-time brought lots of visitors to Errwood, and after 1891, many of these were the Preston family with their children, some of whom came from Ireland. The family of Arthur James Preston and his wife Christina Maria Dundas came from Silverstream, co. Dublin. 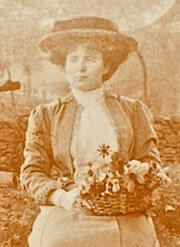 Their four daughters were visitors to the Hall, one of them, Ina Esme Hilda was to stay a very long time. She was the second of the four sisters, Antoinette Eileen Maude, the eldest, Hermione Kathleen Mary, and Marguerite Irene the youngest, and they were cousins to Capt. Edward Francis Preston, who married Genevieve. After Arthur James Preston died in 1896, Esme, when she was about six years old, came to stay at Errwood after her mother was taken ill. Esme, who at first was rather homesick, had her sister Antoinette to stay with her for six months, but she did see her other sisters from time to time. Captain Preston and his wife Genevieve could not have children, so Esme became adopted though not legally. Always the favourite she was virtually brought up at Errwood and indeed spent most of her early life there. It was a great shock and sadness that Genevieve’s husband, Captain Preston, died on the 1st March 1901 at the early age of fifty six. He died while on a visit to Mentone, near Monte Carlo, France. He was extremely well liked by all who knew him. His body was brought home to Errwood, and his coffin borne by members of the family and farming tenants, to the private burial ground behind the Hall. There were many catholic clergymen in attendance and the service was conducted by the Bishop of Shrewsbury. Other branches of the Preston family to visit Errwood were the children and grandchildren of the 14th Viscount Gormanston, William Joseph Preston, G.C.M.G., J.P. and D.L. co. Dublin and J.P. cos. Caven and Meath, High Sheriff, Dublin 1865, and Meath 1871; Lieut. 60th Rifles; Gov, of Tasmaina 1893-1900. His second son was Richard Martin Peter, D.S.O. (1917), Lt. Col., and his children to visit the Hall were Ismay Elizabeth and Diana Mary Bruce. His third son was John Anthony Hubert, M.C., Cart. 3rd Bn. Royal Irish Regt; and his children were Penelope Sybil Mary, Georgina Ismay Mary, and their half sister Daphne Pringle. They were all visitors to Errwood into the 1920’s. Hubert Preston’s children came accompanied by their nurse from Ireland and were treated to trips out to the zoo and funfair at Belle View in Manchester at that time. There were trips out to the Cat and Fiddle on warm summer days for lemonade and picnics in the family’s coach and pair, and there were rides in the new motor car driven by Esme. Halcyon days affectionately recalled by surviving relatives. The sudden death on the 31st March 1924 of Mary’s husband, Helier Gosselin, caused very deep regret, not only in the family and Errwood, but also at Hertford, from where he originated and had taken a keen interest in local affairs. As with all the members of the family, the funeral took place in the private cemetery, on the hill at the rear of the Hall after a service in the private chapel. The arrangements, at the Hall and the chapel were all carried out by the devoted servants, Ignatious Oyarzabal and his son Joseph and the service was conducted by the the Bishop of Shrewsbury, Hugh Singleton, with Father George Naylor preaching an eloquent sermon. Also present were Canon Kind, Buxton; Canon Roach, St Joseph’s, Stockport; Father Byne, Stockport; Father O’Reilly, Whaley Bridge; Canon High Welch, Altringham, and any other priests. Among the chief mourners were: Mrs. H. Gosselin, widow, Lady Gerard, Blakesware, Herts, Mrs. Medlicott, Wilts and Mrs. Smythe-Osbourne, nieces: Lady Gosselin, sister in law; Mr. Gerard Gosselin, brother; Hon. Mrs. Preston and Miss Preston; Dr. Arthur Shipton; Colonel Ramsden-Jodrell; Mrs Hubbersty; tenants on the estate, Errwood Hall servants and the servants at Bengeo Hall, Hertford. The bearers were all from the Errwood estate and included; Messrs. A. Warren, J. Clayton, H. Weir, B. Hibbert, J. Hibbert, J. Rock, E. Trueman, J. Hewitt, T. Jenkinson and J. Cottrill. Funeral arrangements were carried out by Mr. Peter Bennett, Torr Street, Buxton. Both the Grimshawe sisters were now bereaved and ageing, but not quite alone for Esme was still there at Errwood and her sisters and other family members were frequent visitors to the estate. Reminding them perhaps of happy days of their winter holidays in Biaritze and the South of France, which Esme especially loved. The days at Errwood were drawing to an end, but not so the memories and stories of their unending generosity. Of the tramps who passed through the grounds and had to be fed, or the postman who wasn’t allowed the journey back to Buxton without a good meal. The Grimshawe family are always remembered with an everlasting affection. One such story is of the large food parcel sent to the poor children of Whaley Bridge, of whom there were many in the late twenties. It was regularly delivered from an anonymous donor, but local people were very aware of the Grimshawes sisters generosity, and knew well of their kind hearts. They were often seen to travel, when weather permitted to Whaley Bridge or Buxton in the coach and pair which they always preferred to the motor car. Not for them the modern inventions of the wireless and telephone, for there were none at Errwood Hall. Perhaps motor cars would be rather alien to them, having grown up with horses all their life that they knew and trusted. Almost always in their later years they were seen dressed in black lace on their trip through the wooded estate, more often bringing back large bags of sweets to the children at Errwood school. Genevieve died on the 28th January 1929, buried alongside her husband, who was laid to rest some twenty eight years before on that windy outpost of the cemetery on the hilltop. Many of the Preston family travelled to Errwood to pay their last respects, along with many friends and Catholic priests in attendance. The service was conducted by the Bishop of Shrewesbury. Mary Gosselin-Grimshawe, without her devoted sister Genevieve, was now the last surviving. member of Samuel Grimshawe, family, alone with Esme and Antoinette Maud, who had returned to comfort her aunt. In the cold November of 1929, Mary Gosselin asked one of her faithful servants, Mr. Heather, if he could organise a party of Roman Catholics to visit Errwood Hall for midnight mass. It was, she said, a long time since the little chapel was filled at Christmas. Some 40 Roman Catholics attended the mass. Mary Ambrose Louisa Gosselin-Grimshawe, (her full name) died the following year on the 23rd February 1930, and with her death went the glories of Errwood Hall. Joseph Oyarzabal, the trusted estate manager, made the arrangements at the chapel and the cemetery on the hill. A great number of people came to witness the last funeral at the private burial ground, and the service given by the Bishop of Shrewsbury. This then was the final chapter of the Grimshawe dynasty and their association with the Goyt Valley. An association which lasted less than 100 years, but a period in time so cherished with happy memories. Esme Preston and her sister Antoinette Maud were among the main beneficiaries of Mrs Gosselin’s will and they stayed on at Errwood to attend the sale at the Hall which was held in June 1930. There follows an excerpt from the will: Probate (save and except settled land): Manchester, 17th May to Col. the Hon. Richard Martin Preston, William Neville Broadbent, Bury, chartered surveyor, Effects £19,678 3s 4d. Other bequests included the three cottages known as Goyt Vale Cottages, and one and a half acres of land, additional in trust for her servant Ignatius Oyarzabdel for life, with the remainder to his son Joseph. She also left Ignatious £26 per annum during his life, and to Joseph £150. £50 to Ernest Grimes, the last priest in charge at Errwood Hall, £50 to her medical attendant, W. Shipton. £110 and a further sum of £l,000 to her devoted maid Mary Louise Billette, and £500 to her devoted friend Mme. Jeanie Waldejo, sister of her maid. The balance of £500 of the income to the Sisters of Charity Ancoats. £50 each to her servants Mary Brennan, Mary Lomas, Anne Jenkinson and Thomas Jenkinson, if in her service at her death in special recognition of their faithful service. £10 each to the priest in charge of the Catholic Church at Whaley Bridge, and the very Rev. Antonnius Maguire, O.P. St. Sebastions Priory, Pendleton, Manchester. £l00 to the Catholic Bishop of Salford, desiring without any trust that he will apply the income for the benefit of St. Mary’s Church, Clare Road, Levenshulme. £50 to the Convent, Clare Road, Levenshlume. £100 to the Bishop of Shrewsbury, that the income be used for the benefit of the Church at Whaley Bridge, The Sacred Heart. £100 to the Rev. Alexis O’Brian, of the Dominican Order of the St. Sebastions Priory, Gerald Road, Pendleton, Manchester. Stockport Corporation purchased the estate in 1930 to build the Fernilee Reservoir and for a while Errwood Hall was used as a Youth Hostel, but in 1934 the Hall was dismantled for reasons of pollution along with the other thirteen farms and cottages on the estate. With the ravages of time, nature has reclaimed those serpentine walks through the terraced gardens that were harmonious with a Victorian elegance. A place where adventurous children played with delight in the silver brook, giving a warmth to an almost magical place. The glorious blooms of the rhododendrons and azaleas, in the wooded splendor of Errwood, are visited by thousands each year, enjoying the walks around the ruins of the Hall. Where beauty lies broken and unrestored it becomes all the more attractive especially lying in such a romantic location. Lately the ruins have been consolidated, and are in the care of the Peak Park Authority. Taken from Gerald Hancock’s book, ‘Goyt Valley Romance’. The story of the Grimshawe family who built and lived in Errwood Hall in the heart of the Goyt Valley is reproduced here with the kind permission of Gerald and Christine Hancock. 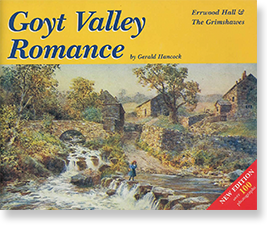 It’s taken from Gerald’s book, ‘Goyt Valley Romance’, which is sadly now out of print.